Read the review in the November 2012issue of NZ Mussician Magazine. Langcaster Guitar Reviews for New Zealand Musician Magazine and Guitar&Bass Magazine. 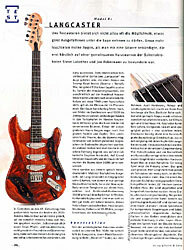 Dutch Magazine "Music Maker" names the langcaster as the Bentley of Guitars. 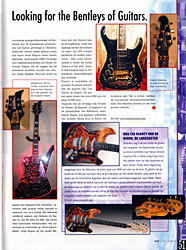 German Magazine "Gitarre & Bass" have seldom seen a guitar that special. Sweden "Fuzz Magazine" Guitar Ace Jan Akkerman on 35000 year old stunning Langcaster guitar. 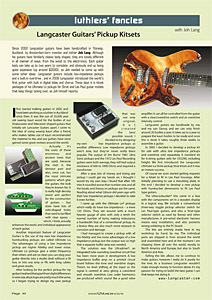 Langcaster Guitar Review in Gitare&Bass Magazine, January 2004.Europe's biggest Guitar and Bass magazine!. For us testers there is seldom the possibility to take something special under the loop. Therefore my eyes flashed when they notified me of a guitar, which shortly ago appeared in the joined short tour of strings acrobats Steve Lukather and Jan Akkerman made its striking appearance. This is the most popular model with 3 Langcaster pickups,Treble bypass filter, Carbon shielding is standard on all Langcasters. Jan Akkerman played Langcaster on the Jimi Hendrix tribute tour. Guitar Ace Jan Akkerman with over 70 Lp's and Cd's to his name with Focus and many solo projects, is known for his taste of exquisite guitars ! It is remarkable that Jan Akkerman favored Lancaster for his Jimi Hendrix Tribute Tour together with another guitar legend Steve Lukather of (TOTO).
" For this Hendrix tour I had to play a Strat. I generally dislike Fenders but this Langcaster was something else. Good appearance with 35.000 years old Swamp Kauri wood, very appealing. The feel of this Langcaster is good, and the hardware is of superb quality. "Hi Joh, it is one of the most beautiful strat models I have ever played on" Jan Akkerman. See more photos and read what Jan Akkerman had to say, click here! 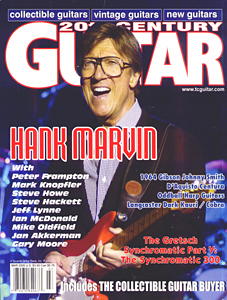 Langcaster Guitar Reviews for New Zealand Musician Magazine and Guitar Player Magazine. 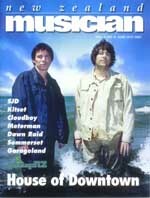 In this issue of Nzl Musician you can read a Langcaster review by Dominic Blaazer. Click on the cover, then click Gear Reviews, then click on Guitars.